The panel itself did not disappoint. Kathryn Lofton gave an engaging, substantive, and original talk, as Lofton often does. Lofton reminisced about her time as an undergraduate student of Smith’s at Chicago, taking the opportunity to use her personal experience with Smith’s pedagogical strategies as a chance to compare his theory and practice. Lofton, deploying an analogy that will stay in my head for quite some time, compared Smith’s essays on teaching to the works of Frank Lloyd Wright: beautiful, carefully planned, and inspiring structures that people flock to see–but also structures that are prone to leak when it rains. An introductory course must feature a good bit of activity….For example, there should be short weekly writing assignments on a set task that requires reflection, argumentation, and risk-taking. Each piece of writing must be rewritten at least once, regardless of grade, and this requires that every piece of writing be returned to the student, with useful comments, no later than the next class period…an ethic of revision rather than originality should prevail. Among other devices, I ask my students to keep two notebooks, one for class and one for their reading. They are to make their notes on the right-hand pages and register queries, thoughts, conversations (with attribution) with other students, and, above all, revisionary proposals and re-readings on the left. At least once a quarter, I call in all students’ notebooks and texts. After reading them through, I have individual conferences with each student to go over what they’ve written and underlined and to discuss with them what this implies as to how they are reading and reflecting (1). Lofton’s point was that Smith’s practice often diverged from his pedagogical theory. She remembered no interactions that took the form described in Smith’s various works. Her point was not to suggest that Smith was being untruthful, or that her experience was necessarily representative. Rather, she pointed to the tension between our lofty ideas about teaching and the day-in-day-out reality of instructing students (particularly in our introductory courses) who are interested and indifferent to varying degrees. I appreciated her honesty. The other panelists did not disappoint. Kurtis Schaeffer spoke at length about the need to move beyond Smith’s “six words”–that is, the famous passage from Imagining Religion where Smith argued that “there is no data for religion.” Schaeffer pushed back against scholars who cite this passage and move on, as if they have now paid the pied piper of critical theory. Christopher Lehrich, the editor of the volume under discussion, said that he understands the “Iron Rule” of Smith’s pedagogical theory to be that “no student may be asked to integrate what a faculty member will not.” Lehrich argued that faculty problematically refuse to integrate some concepts in their courses because they want the students to have the illusion of raw material. Another interesting moment was provided when a member of the audience asked the panel how Smith would articulate the purpose of a Religious Studies program: what, exactly, is it that RS scholars do? 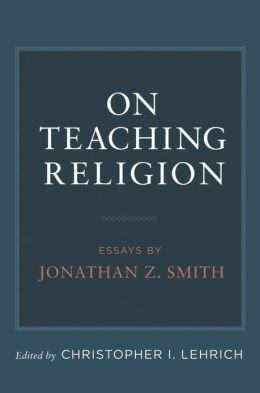 Nancy Levene (who has written previously and insightfully on Smith and his relation to teaching) had a particularly sharp answer when she argued that, for Smith, the “point” of Religious Studies programs is not something along the lines of “narratives into problems.” Instead, Levene argued that if we are to take Smith’s work seriously, what the academic study of religion is uniquely positioned to contribute is offering an opportunity to expose our colonial histories and confront the resulting conflicts in thought and category at the same time. As someone interested in the connections between American history and religious studies, this struck me as a useful position to take in the ever-present debate about the utility of the academic study of religion. (1) Smith, “The Introductory Course: Less is Better,” 729.